NEW YORK (AP) — Levi Strauss & Co.’s return to the public markets got an enthusiastic reception from investors who believe the iconic brand is ready for a comeback — and still has a lot more room to grow. The stock, which is listed under the ticker “LEVI,” opened for trading Thursday at $22.22, above the $17 offering price and blowing past the originally expected range of $14 to $16. As of Thursday’s close, shares popped nearly 32 percent, closing at $22.41 per share. That gave Levi’s a market value of $8.64 billion, according to FactSet. Levi’s seems to have successfully convinced investors, at least for now, that it has a lot of opportunities to expand beyond just jeans, from tops to bolstering its women’s business. In its prospectus, the company says it plans to use the proceeds from the public offering to expand more aggressively into China, India and Brazil and also build out more retail stores, which as of late last year totaled 824. But jeans are still the company’s mainstay and that was apparent on Thursday, when in a rare move the New York Stock Exchange suspended its “no jeans” policy to commemorate Levi’s re-entry, transforming the floor from suits and ties into a sea of blue denim, with its traders sporting jeans and denim jackets. The 166-year-old company is proving to Wall Street there’s staying power for a legacy name that dates back to 1853 when its namesake founder started a wholesales dry goods business in San Francisco. Strauss and tailor Jacob Davis invented jeans 20 years later after receiving a patent to create cotton denim workpants with copper rivets in certain areas like the pocket corner to make them stronger. By the 1920s, Levi’s original 501 jeans had become top-selling men’s workpants, according to its corporate website. Levi’s previously went public in 1971, but Strauss’ descendants, the Haas family, took it private again in 1985. Today, it stands out from a string of tech companies — from Spotify to Dropbox — that have made their debuts in the public markets in recent months. The IPO comes amid increasing competition and a changing retail landscape. Women are opting for yoga pants or other comfortable athletic sportswear that can be worn every day. And Levi’s is contending with a shrinking number of department stores, once its traditional venue of distribution. Discounters like Walmart have also been developing their own exclusive brands. Since assuming the helm in 2011, Bergh has refashioned the brand and image. It didn’t chase after the yoga trend but rather focused on enhancing the fit of its women’s jeans with stretchier fabrics. Bergh also has created buzz with partnerships with celebrities like Justin Timberlake while increasing Levi’s marketing at events like Coachella, where Beyonce performed in the brand’s cut-off shorts. At the same time, Levi’s has been expanding online and juggling between selling to low-end and high-end stores. Bergh told AP that it’s capitalized on its resurgence and that even as the brand saw 300 store closures, Levi’s enjoyed an 8 percent growth in sales to its wholesale accounts. The timing may be right for Levi’s. 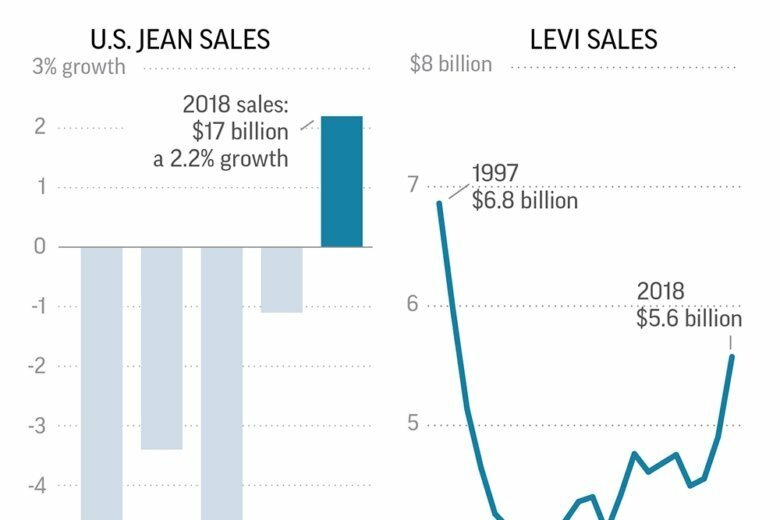 Jeans sales appear to be on an upswing in the U.S., increasing 2.2 percent to $16.7 billion last year after four straight years of declines, according to data from Euromonitor. In its return to the public market, Levi Strauss is adopting a dual-class share structure. Each Class A share will be entitled to one vote, while Class B shares will have 10 votes. Class B stock will primarily be held by the descendants of the company founder. That means that the Strauss’s descendants will still exert big influence over the company’s major decisions. Bergh said the dual-class structure was a topic of conversation during meetings with investors as the company went on the roadshow. But he said that having a strong family influence ensured that Levi’s strong values would remain.